How many of you remember eating at Mother’s Pizza Parlor and Spaghetti House? 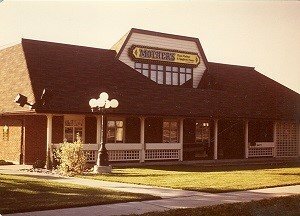 This week’s Throwback Thursday pic is of the Mother’s Restaurant located at 6415 Tecumseh Road East. Opened not long before this photograph was taken in October 1980, this location was the second Mothers Restaurant to operate in Windsor, with the first opening in 1978 at 819 Ouellette Avenue. The Tecumseh Road location continued to operate until 1990, with Ouellette Avenue location closing in 1992. Today neither building stands, with the Tecumseh location having been replaced by the European Market and the Ouellette location a gravel parking lot. If you would like to view other historic photographs of Windsor please visit Windsor Public Library’s digital exhibit ‘Windsor, History and Pictures’ at http://heritage.windsorpubliclibrary.com/. The site at 819 Quellette was for many years an A&P grocery store and was replaced by the A&P on the Patterson High school, and later rebranded Food Basic. The building next to A&P on Ouellette was Rose Furniture store.